Already attracting large numbers of International fighters, the Brighton Open has been announced for 7th September. More details as they become available, meanwhile put it in your diaries! GBSF Squad Training and Open Training will take place side by side on Sunday 28th April in Four Marks, Hampshire, 11 – 4.30. There is also an opportunity to qualify as an official, or refresh and update your officiating knowledge, and a Canne de Combat seminar by World Champion Nicole Holzmann. 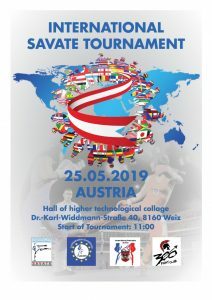 25th May 2019 – an open international competition for all ages. Here is a list of the FISav International competitions coming up in 2019. This event is being hosted by Savate Northern Ireland on Saturday the 30th of March at St Patrick’s Hall, Bryansford, Northern Ireland, from 9am. Savateurs who are under the age of 18 on the day of the competition may enter the British Junior Championships, subject to fulfilling the Eligibility Requirements. Non-eligible juniors and adults may enter the Open competition. Entrance fee is £15 per child and £20 per adult with £5 discount for any adults who are acting as officials on the day. This opportunity to grade for either blue or green glove is open to all GBSF members, hosted by London Savate. If you wish to grade for a higher glove, please ask your instructor to get in touch with James Southwood (London Savate Head Instructor). Please discuss grading with your instructor before you register for a grading! Information about GBSF Savate Glove gradings. Please apply to grade here and make a payment below. GB Team will be selected for this tournament. Please get in touch with a GBSF instructor if you are interested in supporting or attending a future competition. Please get in touch with a GBSF instructor if you’d like to know more about this competition. This opportunity to grade for either blue or green glove is open to all GBSF members, hosted jointly by Guildford Savate and City Combat Savate. If you wish to grade for a higher glove, please ask your instructor to get in touch with Sian-Marie Frosini (City Combat coach). The day will also include open training at the same time for anyone who does not want to grade, but wishes to train with new instructors and students from around the country.